I really adore the Lady Janies' books. 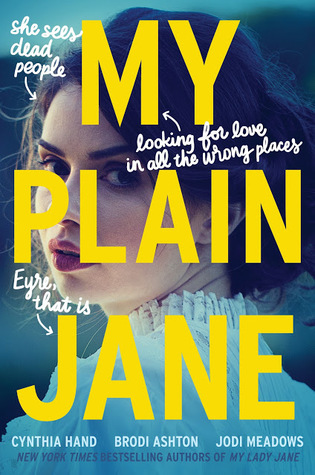 Their novels are always fun, hilarious takes on classical novels, and My Plain Jane was no exception. This book, like its predecessor, is one of those light-hearted stories that makes your world feel a little bit brighter, just by reading it. I enjoyed Hand, Meadows, and Ashton's take on Jane Eyre, and agreed with most of their quips about the novel. I wasn't a huge Jane Eyre fan due to my dislike of Rochester, but I have immense respect for both of the Brontë sisters. This book does Brontë's novel justice and pokes fun at some of the ridiculousness in the original story, too. I'd recommend this to anyone who is looking for a fun, unique read. The characters in this book were amazing. Charlotte, Jane, and Alexander each told the story from their own perspectives, and each character was fully developed and so "human," that I couldn't help but relate to all of them in some way. The secondary characters were equally engaging, and Bran was a particular favorite of mine, as was Helen. I love how they painted Charlotte as a clever, creative, and mischievous teenager. In all of the portraits of the Brontës, they always looked so stern... I prefer to think of Charlotte as these authors created her - an adventurous spirit who appreciated everything in the world around her. I also enjoyed the idea that Charlotte and Jane were friends and that's how Jane Eyre came to be. The writing was brilliant, of course. These authors are professionals, and it shows in every novel they create. They tempered humor with seriousness, and at times, sadness. I felt a range of emotions while reading this novel and found myself rooting for all of the characters who weren't "nefarious villains." This is a longer novel (when it comes to YA lit, over 450 pages), but I flew through it. The pacing is spot on and nothing feels rushed. The plot has a few holes that may be corrected before the final copy goes to print, but it's also clear (as it was in the last novel) that this is supposed to be a lighthearted story and some of the outlandish plot points are supposed to be accepted for the sake of the story. Overall, I say give this book (and series) a try. If you're a fan of classical literature, or you just like people named Jane, then you'll love this book. Each novel can be read as a standalone book, too, though there was a cameo from Jane and G from the first book that I enjoyed. This novel is the perfect light summer read. I can't wait to see what these authors come up with next. This sounds like a fun twist on the classic story.